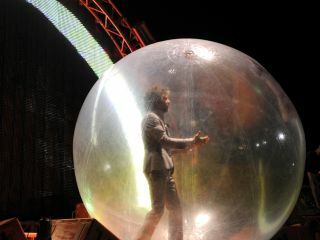 The Flaming Lips' version of Pink Floyd's classic Dark Side Of The Moon will be issued on CD in the UK on 28 June. Recorded last year, in collaboration with Stardeath And White Dwarfs (a band that features Lips frontman Wayne Coyne's nephew Dennis on vocals), the album was initially available as an iTunes-only release. Last April, Warner Bros put out a vinyl version to coincide with Record Store Day. As Coyne told MusicRadar, the project originated when iTunes approached both bands in the hopes that they would record some new material, together or separately. "Trouble was, we didn't have anything," said Wayne. "So, kind of kidding, I said, 'Hey, why don't we record Pink Floyd's Dark Side Of The Moon'? And then the joke wound up being on me because they loved the idea." Once the bands were given the go-ahead to record the iconic Floyd album, Dennis Coyne described the situation as "incredibly daunting. It went from 'All right, they're letting us do it!' to 'Oh, no…they're letting us do it.' But we decided very quickly that we weren't going to try to repaint a Picasso line-by-line; we were going to have our way with it. And then it became a blast." Although Wayne Coyne acknowledges that he's regarded highly in alternative rock circles, he never had a problem admitting to his respect for Floyd: "Even when punk rock came around and there was this anti-Floyd vibe everywhere, I was always the guy to go, 'Well, I'm totally into them.'" Both The Flaming Lips and Stardeath And White Drawfs have been touring behind Dark Side Of The Moon. Next up are festival dates, which include an appearance at Bonnaroo.